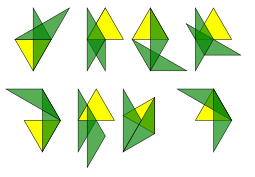 Here are two triangles. We're going to see what shapes we can get by using many of them. Try making that or something similar. See what "jewels" you can make. When you do that, you might try to see what shapes you've made at the overlap. Please do send in pictures of the shapes you make, whether they include overlaps or not. Tell us what you notice about the shapes you've made. Interactivities. Visualising. Practical Activity. Triangles. Symmetry. 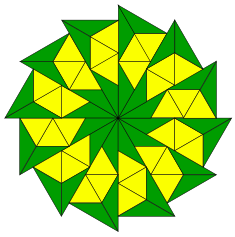 Tangram. Addition & subtraction. Compound transformations. Investigations. Working systematically.